Enjoy all the sweet flavors of the Easter holiday with a smorgasbord of treats for the whole family. That always includes a tasty ham, hot cross buns, chocolate rabbits, cream filled eggs, cookies, cakes and other delicious Easter staples. Choose these or other fabulous foods to include in your Easter celebration, add a few fun twists and enjoy them with friends and family. Before we get to the scrumptious sweets of the Easter holiday, let's take a look at some delightful ideas about the main course. Every family has its own traditional favorites, but the honey baked ham is the most popular item on the Easter table in America, and in other countries as well. Of course, if ham doesn't hit the spot, you can always replace it with a leg of lamb. But whether you decide to purchase your ham from a specialty store or grocery store, or bake your own, don't forget to include this beloved dish in your annual soirée. And nothing goes better with a juicy ham than hot cross buns fresh from the oven. Try upgrading the traditional cross on each bun with an egg or other Easter-inspired shape carved in instead to create a delicious bun that also functions as an easy conversation-starter. Of course Easter just wouldn't be the same without all your favorite decadent desserts of the holiday, like chocolate rabbits, chocolate eggs, jelly beans and cake. A fun and easy way to share your Easter candies with friends and family is to wrap them in a fun Spring themed shape that will have the everyone jumping for joy! For example, try making a cute candy gift to pass out to guests by wrapping a bag of candy so it looks like the Easter Bunny's carrot. All you need to do is buy orange tissue paper or plastic wrap from a craft store or supermarket, wrap a sheet around a bag of candy of your choice and roll it into a cone shape to create a carrot. You can even add a green pipe-cleaner around the end to complete the look. Another sweet treat you can enjoy as much while making it as you do while eating it, is Easter cookies! Try any recipe, from sugar cookies, chocolate chip, and snicker doodle, to ginger bread and short bread. Using Easter shaped cookie-cutters, bake several batches of cookies, wait for them to cool, and then decorate them with the kids to enjoy on Easter Sunday. 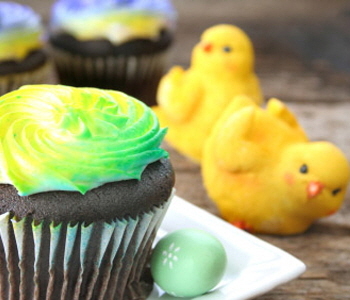 You can create your own icing at home using powdered sugar, water and food coloring, or buy decorating icing at the supermarket in Easter colors such as yellow, white, pink and blue. Then decorate away to produce beautiful and tasty cookies to indulge in every Spring season. For the grand finale, include a fabulous Easter cake for your holiday celebration. Starting with your favorite family recipe or one you found off the internet, bake whatever flavor of cake you love and then carve each layer in the shape of an egg, rabbit or basket. Then decorate your creation with bright frosting, icing, sprinkles and maybe even Marshmallow Peeps and enjoy after your Easter feast!